Set in an acre of hilltop garden and orchard, Rhyll Haven Cottage offers luxury, space and privacy. It's the perfect island getaway for couples, less than two hours from Melbourne. Indoors there's a huge open plan living area with soaring timber ceiling, comfy furnishings and entertainment system including a widescreen TV, Smart Blu-Ray disc player and fast free NBN wi-fi. Stay comfortable all year round with air-conditioning and overhead fans in summer and a real log fire for the cooler months. 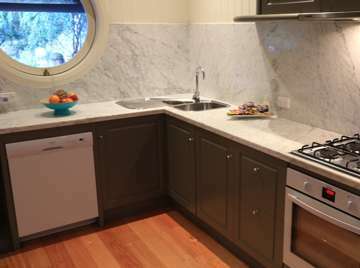 The designer kitchen has every convenience so you can truly hide away here and self-cater for a weekend or weeks on end. 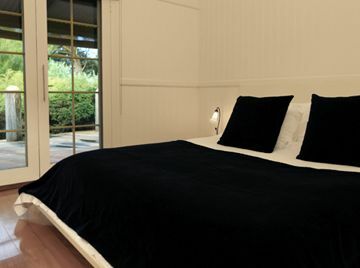 A separate bedroom with a king size bed and spacious robes flows through to a luxurious bathroom with a huge spa bath for two and a separate double walk-in shower complete with fluffy towels, bathrobes and luxurious Molton Brown bath and body products. Open the doors wide and step out onto the gorgeous winding timber deck. Enjoy a lazy day in the sunshine or whip up a BBQ in complete privacy. 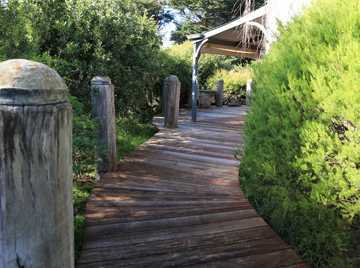 The deck and cottage are fully screened by Rhyll Haven's Australian native garden which is full of colourful birds from the ground to the tree-tops and all yours to wander through and enjoy. Rhyll Haven Cottage is perfect for couples and sleeps a maximum of two adults.